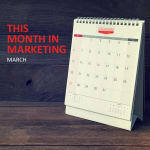 Many months are marvellous for marketing, but most of all is March! Here’s our wrap-up of what happened in March. The issue that divided the globe – is the dress black and blue or white and gold – was turned on its head with some responsive social marketing by South Africa’s Salvation Army. This campaign for the Art Series Hotels in Melbourne looks to turn the tables on reviewers. Taking back the strange phenomena of “reviewer culture”, the premise of the “Reverse Reviews” campaign is simple: reward good behaviour with complimentary stays, upgrades and food and drinks. Facebook takes out the gong again for “Most Popular Social Network Among Youth” (12 to 24 year olds) in the Infinte Dial 2015 report. Silver went to Instagram, Bronze to Snapchat and Honourable Mention to Twitter. YouTube stars are the new influencers for young people. More relatable than movie stars, over 60% of all young people surveyed said they would buy a product recommended by a YouTuber, while less than half said the same for a movie star. What do Meerkats and Periscopes have in common? Quite a bit, if you’re referring to live streaming apps. Live streaming apps are the latest platforms that social media channels such as Twitter are looking to integrate. What does this mean for content marketers? An opportunity to personify the brand voice and present compelling video that encourages high engagement. Ah, the illustrious quest for organic reach on Facebook proves to be more challenging with every passing day. One thing is for certain, posts with links draw the most organic reach followed by videos, text-only updates and photos according to social analytics firm Locowise. And finally, L’Oréal Paris’ “Makeup Genius” app allows both models and mere mortals alike to try their products and the latest looks by downloading their app. It’s only a matter of time before the app becomes e-commerce enabled. Did you miss February’s month in Marketing? Read it here.